As unlikely as it may seem, we have launched a Kickstarter. Actually, it’s not all that unlikely, really. We received so many incredible submissions for Issue #11.5: The Journal of Unlikely Coulrophobia, we couldn’t possibly contain them in one issue. Like clowns in a car, we couldn’t help wanting to fit in more. So we decided -- why not try to put together an anthology? Our very first! So that’s what we did. 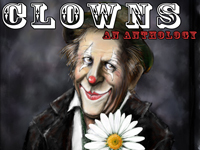 If it’s funded, Clowns: The Unlikely Coulrophobia Remix will reprint the five stories from the current Unlikely Coulrophobia mini-issue, and bring you additional flash fiction stories by Mari Ness, Kristen Roupenian, Evan Dicken, Line Henriksen, Holly Schofield, and J.H. Pell. We’ll also re-open to submissions. The more funding we get, the more stories we can add. The anthology will feature cover art by Linda Saboe, and black and white interior illustrations by Bryan Prindiville. More funding means more illustrations, too. That’s the short version. For more information, visit our Kickstater page. We have some fabulous rewards to offer -- microfictions by Sara K. McNeilly, limericks by Mari Ness, story critiques by Evan Dicken, and Bernie Mojzes and A.C. Wise, original art by Linda Saboe, and Bryan Prindiville, and, of course, copies of the anthology. If for no other reason, you should visit our Kickstarter page to watch the truly horrifying video we put together. If you ever wanted a mix of the Unlikely Story editors embarrassing themselves and clown imagery to keep you from sleeping, this is the video for you. Then maybe you could throw us some money out of pity? Or because you believe in this project (we sure do!) and because you want more heartbreaking, funny, horrifying, lovely, and gut-punching stories like the ones we just published in Issue 11.5. We promise not to let you down.